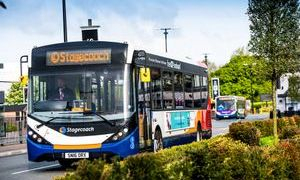 Stagecoach has partnered with Alexander Dennis Limited (ADL) and Fusion Processing to trial an autonomous single-decker bus. Once complete, the 12m ADL Enviro200 MMC will be completely autonomous and able to operate without a driver in an off-road environment. The technology is also expected to deliver road safety benefits when driven in manual mode. Work on the vehicle is being carried out at ADL’s site in Guildford and the bus is expected to be ready for use by the end of 2018. 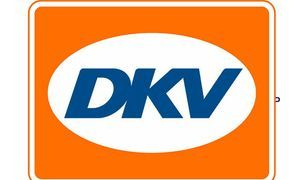 CPT Commercial Partner, DKV Euro Service, has recently extended its acceptance network in Italy and Switzerland. DKV customers can now pay for their fuel using the DKV CARD at over 200 additional Eni brand stations in Italy. This extends the Italian acceptance network to 7,407 fuel stations. DKV has recently added 175 fuel stations operated by TamOil to the acceptance network in Switzerland. Customers in the Alpine republic now have a total of 500 stations available. From 1 July, the extent of tolls for commercial vehicles in Germany will increase significantly. DKV recommends that operators who require new toll boxes at the start of this extension should register well in advance and use its Toll Collect Box. Only the on-board unit provided by Toll Collect will be capable of officially invoicing the extended toll in Germany. 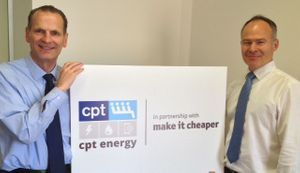 CPT has today (21 May) launched CPT Energy, a new service dedicated to helping members get the very best rates from utility providers for their business energy (gas and electric). Launched in partnership with CPT’s new Commercial Partner, Make It Cheaper Ltd - the UK’s leading business energy switching service - CPT Energy has been designed to save members time, money and hassle when both dealing with utility companies and switching tariffs at contract renewal times. In addition to business energy, CPT Energy also gives members access to a similar Business Telecoms and Business Water services. Ensuring your fleet is compliant is vital for a passenger transport business of any size. The safety of your customers, drivers, other road users & pedestrians is paramount and daily walk around checks are a key part of the system that gives you, as an operator, peace of mind that your business is doing the right things. That’s why the team at Sheffield based Digital 2000 (the team behind the TachPro range of tachograph & compliance consumables) have developed CheckPro Compliance Management, their new digital defect reporting system. CheckPro offers walkaround check apps for both iOS and Android that send reports instantly to the CheckPro Management System (CMS) Dashboard where managers can view any defects reported and manage them accordingly. 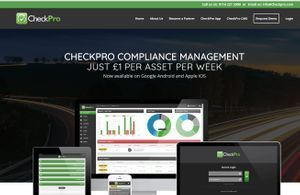 Priced at just £1 per asset per week, CheckPro is available now and CPT members can take advantage of an exclusive offer to get 12 months for the price of 11. Find out more by visiting www.checkpro.com where you can sign up for an online demo and get a free trial to test out the system for yourself, alternately call 0114 2212000 and speak to one of our experts today. TOTAL UK has launched a new website (https://www.total.co.uk/), with improved features and functionality. 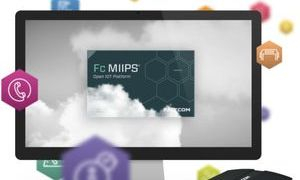 The core objectives for the new site were for it to be more customer centric, solution and mobile orientated. Utilising responsive design, the site adapts to whatever device it is being viewed on, while the content has been restructured, making it easier for visitors to find what they are looking for. Have you ever questioned how many people actually get on & off your Buses, where & when? 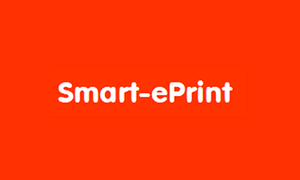 Smartran is delighted to be assisting Confidex with the launch of their smart media printer in the UK and to be setting up a bureau to help organisations benefit earlier from the new technology. 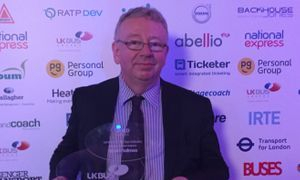 Bus companies, local government and suppliers across Britain are celebrating their success in the 2017 UK Bus Awards, which this week announced the winners of its 22nd annual competition at a glittering ceremony before over 710 industry movers and shakers at Troxy In London’s Docklands. Go South Coast was named UK Bus Operator of the Year in 2016, having earlier been victorious in the closely-fought contest for the title of Top Shire Operator. In addition, the company’s Eastleigh depot scooped the Gold Award in the contest to find the UK’s Top National Bus Depot – a unique hattrick for the business. 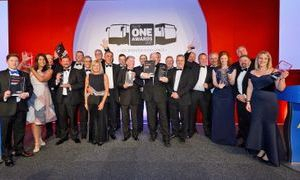 The UK’s best bus, coach, and minibus operators were revealed last night (4 October) at the prestigious routeone Awards 2017, which took place at the Hilton Metropole in Birmingham; following the first day of Coach & Bus UK. Stagecoach, Arriva UK Bus, Go North East, Go South Coast, Go-Ahead London, Homeward Bound Travel, Horseman Coaches, Plymouth Citybus, Golden Boy Coaches, Pulham & Sons (Coaches), The Kings Ferry, Ensignbus, and Easton’s Holidays, were among the operators to take home awards. 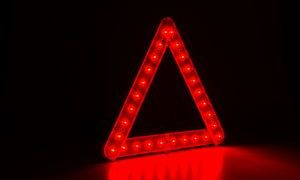 Road Safety Designs has developed BrightAngle, a warning triangle that has been revolutionised to improve safety. Its flashing, high-intensity LEDs allow a hazard to be seen from up to 300 metres away, in all weathers and at all times of the day and night. The warning triangle helps road users to stay safe when a vehicle is stopped at the side of the road. Optare has secured its biggest-ever Australasian export order, with a £21m deal to supply 114 Metrocity buses to Tranzit Group, whose MD Paul Snelgrove describes the purchase as a “no brainer.” Tranzit is one of New Zealand’s largest public transport operators, and the buses will be used in and around Wellington, the capital city. Optare, the UK’s third-largest bus manufacturer, will deliver the first buses in March 2018, with final deliveries by July 2018. 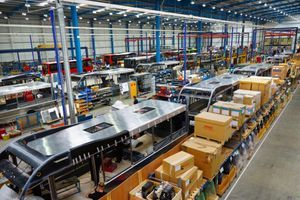 The Euro 6 buses will be built at Optare’s Sherburn-in-Elmet, North Yorkshire plant. 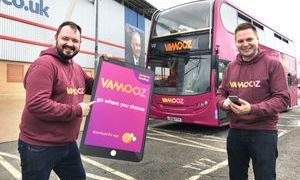 A positive breakthrough for public transport in the south of England – that’s how a new bus travel app is being described by Reading Buses. At the launch of the new crowdfunded bus app, Reading Buses CEO Martijn Gilbert, said it was a ‘groundbreaking solution’ that will bring a new dimension to affordable travel beyond the traditional local bus network, leading to many more journey opportunities. 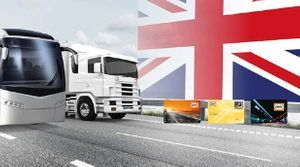 Safety specialist Sentinel Systems has added a new warning sign to the Bike Hotspot product to further reduce the number of accidents involving cyclists and large vehicles. 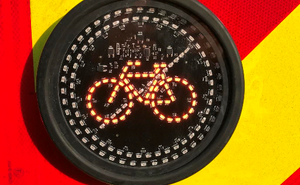 The ultra-bright LED sign gives cyclists approaching the rear of a vehicle a clear warning that it is about to turn left. 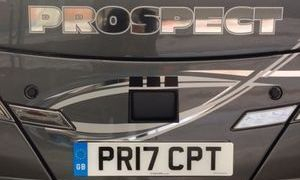 Prospect Coaches yesterday took delivery of the latest edition to its fleet – a Plaxton Elite Volvo B11R Euro VI vehicle with the registration plate PR17 CPT.